What do the following words all have in common? Baby, Bernice, Charlie, Dream, Florida Snow, Girlfriend, King, Monster, and Society High. They are all different ways to say cocaine. Perhaps I am just old school, but I really had no idea the amount of lingo out there around drugs and drug use. The comprehensive nature of this book is both frightening and reassuring at the same time. 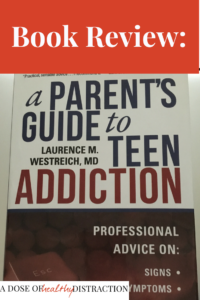 In his book A Parent’s Guide to Teen Addiction, Dr. Laurence M. Westreich presents a comprehensive set of symptoms and strategies to help parents help their children. Health concerns are many and varied, from rapid heartbeat to hallucination and seizures, and there is a convenient chart listing some of the most common addictive substances teenagers may experiment with. According to the author the biggest relational issue for families is that by nature, an addict must manipulate people in order to perpetuate their addiction. When this happens with parents it is troubling on several level. Not only that, but many teenagers withdrawal from their normal peer interactions and hang out with different people when they become addicted. This causes them to struggle in the future if they are able to recover and seek out healthier peer relationships. Other signs including dropping grades, concerned calls from the school, and disinterest in activities that once were important. Personally, I think a parent’s gut instinct is important as well. Westreich includes a small “points to remember” section at the end of each chapter which helps to trim down the information into bit-sized chunks. Dr. Westreich starts this chapter by making an important point about alcohol – namely, that creating a zero-tolerance policy for your teenager actually doesn’t work. He instead advocates for open communication and realistic expectations of both parents and children, which I find refreshing. The author goes on to list some warning signs if you think your teen might be misusing alcohol. He does the same in a chapter about cocaine and methamphetamine, marijuana and hallucinogens, opioids, steroids, and stimulants. His expertise is evident in his descriptions of the side-effects and usage habits of each of these substances. Dr. Westreich also gives realistic examples of how a conversation might go with your own child. He uses the typical language and dialogue of a parent and child, and his point is made well. This is the only section of the book I was iffy on. Basically, the author feels that stimulant medication is likely to be abused by teenagers. While I do agree that this happens, I would argue that for a young person living with ADHD the benefits outweigh the risks. He does mention that the immediate release medications might be more “pleasurable” to a user, thereby being potentially more addictive. I took immediate release Ritalin for years, and only once did I have the wrong dosage. It was not a good feeling. I never found the sensation pleasurable. And throughout my entire high school and college experience, nobody ever asked me to sell them or give them my Ritalin. It might be more common now, though. Bottom line: Anyone, whether child, teenager, or adult needs to be closely monitored when taking stimulant medications. The last part of the book focuses on determining what type of treatment you might need for your child who is addicted. Dr. Westreich does a fantastic job explaining the options, from counseling to inpatient treatment. He gives sound, realistic advice about what to expect and how to ask for the help your family needs. He discusses the role of mental illness in substance abuse and the diagnostic processes and treatments for a dual diagnosis. The author explains how to choose a therapist or rehabilitation program, as well as what to do if your teenager refuses treatment. He goes on to explain after treatment and the common courses of rehabilitation for young people. Again, there are example conversations and bullet points at the end of each chapter to keep you on track. Overall, I was surprised by this book. At first glance I thought it would be much more fear inducing. I was expecting a zero-tolerance approach, and what I got was much more realistic and well thought out. This book is more reassuring than it is frightening. It makes you feel like you know what to look for, and how to handle the information you gather. Dr. Laurence Westreich is obviously an expert in psychiatric addiction treatment as well as a thought leader in parenting circles. This book is perfect for anyone who is parenting a teenager and feels out of touch with today’s drug culture. We all know about the opioid epidemic. But there is more than just that. This book opens your eyes without scaring the bejeezus out of you. You can learn a ton of information just from the charts and bulleted information.